The ultramodern and bustling landscape of Singapore has beckoned to us today, with its multicultural vibe, stunning landmarks, exciting street fare and more. 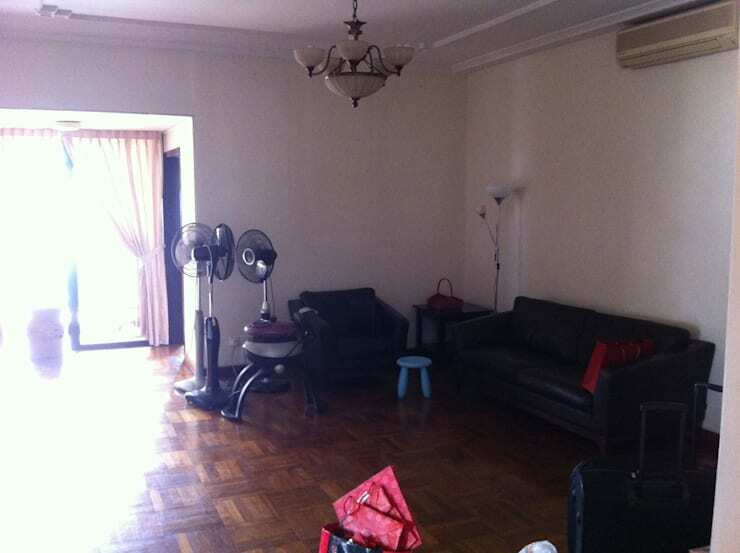 In the midst of all this, the residence in Yong An Park is waiting for you to explore its makeover journey eagerly. The house was initially a dark and depressing place dotted with dated furnishing and old-fashioned fixtures. With ageing walls, drab floors and uninspiring designs, this abode was crying out for a more fashionable and contemporary transformation. And the interior architects at Jia Studios LLP achieved exactly that! The revamped house is now incredibly attractive with rich textures, gleaming surfaces, chic accents and brilliant lighting. So, gear up to be surprised. There is nothing remotely likeable about the old living room. The shabby walls, drab and dark floor and dated chandeliers do nothing aesthetically pleasing for the room – it is impossible to visualize a relaxing evening here! Now, here is a living area we can relax in and enjoy! We simply adore the futuristic and shiny chandeliers that look like delicate spheres consisting of a thousand twinkling stars. 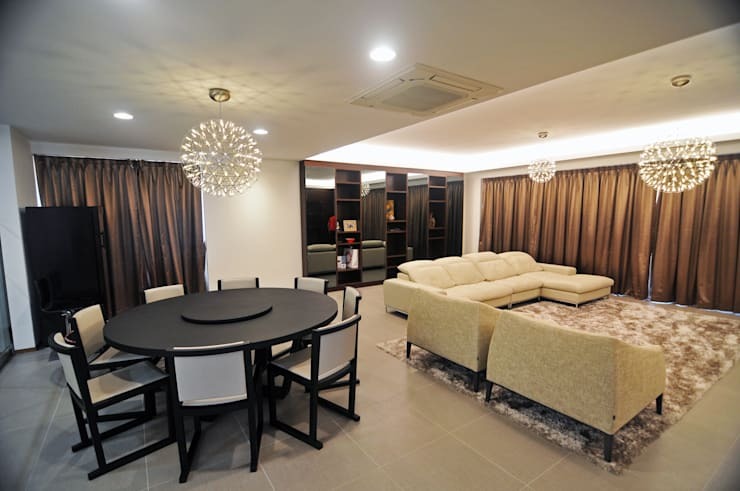 The drab floor was replaced by light beige tiles that are beautifully complemented by sophisticated plush cream sofas, elegant brown curtains and a stylish cream and brown carpet. In the dining area, the smart round table is offset by stylish white-backed dark chairs for cozy and modern seating. What a delightful setting for a family meal. This space was not even an excuse for a family room previously. The room looked dismal despite the light coming in through the window, and the black sofa was drab and ugly. The dingy chandelier and the brown floor just made the room look even drearier. This is a terrific transformation – what a masterpiece of remodelling! The black and white theme is stunning, and the jazzy monochromatic carpet provides the perfect splash of glamour in the mix of black and white furniture. The light beige floor offers warmth in the room and acts as the perfect canvas for monochromatic razzle-dazzle. The gleaming designer white cabinets, the little lights set in the ceiling, and the warm glow of the lights hidden in the recess above the family work desk – all these come together to create an aura of modern elegance in this room. The kitchen is a classy affair with an elegant white and grey colour palette, clean lines and small lights fitted in the ceiling. We adore the touch of glamour in the shape of the snazzy futuristic lights hanging from the ceiling. 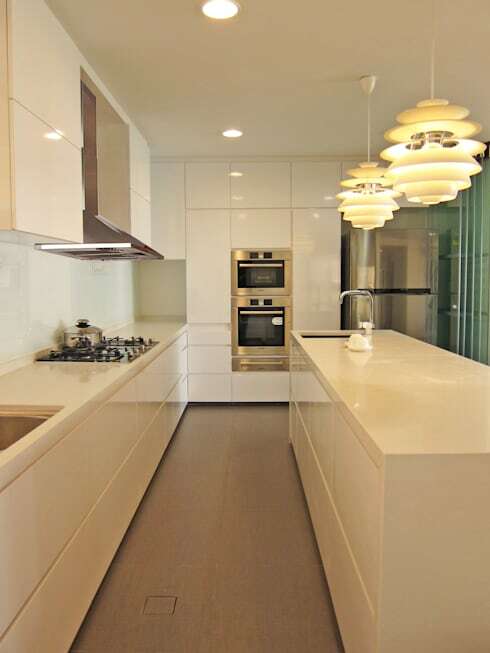 It will certainly be a joy to cook in this stylish kitchen! 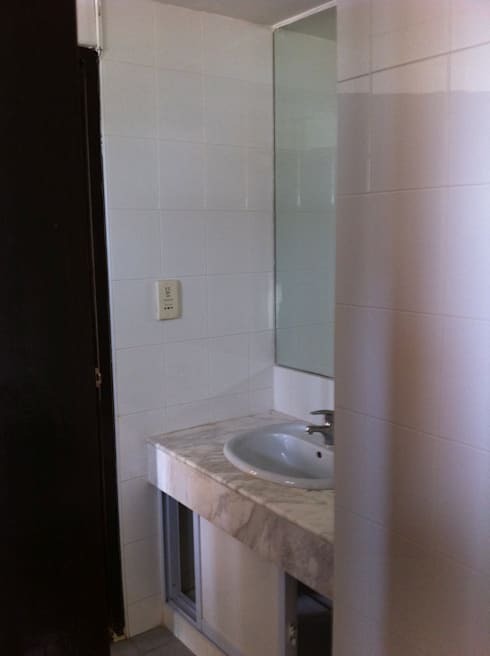 This was a very run-of-the-mill bathroom and looked shabby and dull. A small, ordinary washbasin was set in a dingy countertop, and the entire look was uninviting and uninspired. Now, the immaculate white and grey colour scheme looks elegant and the curved washbasin atop the spruce marble countertop is stylish indeed! The grey mosaic border above and below the large mirror adds the perfect touch of colour and class. 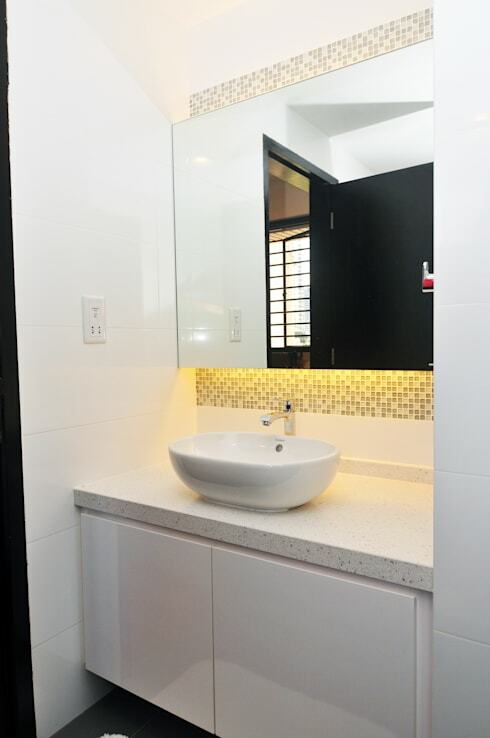 The recessed lighting that sheds a soft, warm glow from behind the mirror is a stroke of genius. This is a bathroom that will be a pleasure to visit! The professionals have done a splendid job of changing a caterpillar into a butterfly with this house! The formerly drab abode is now an extremely stylish, modern and comfortable home with masterful touches of futuristic glamour. 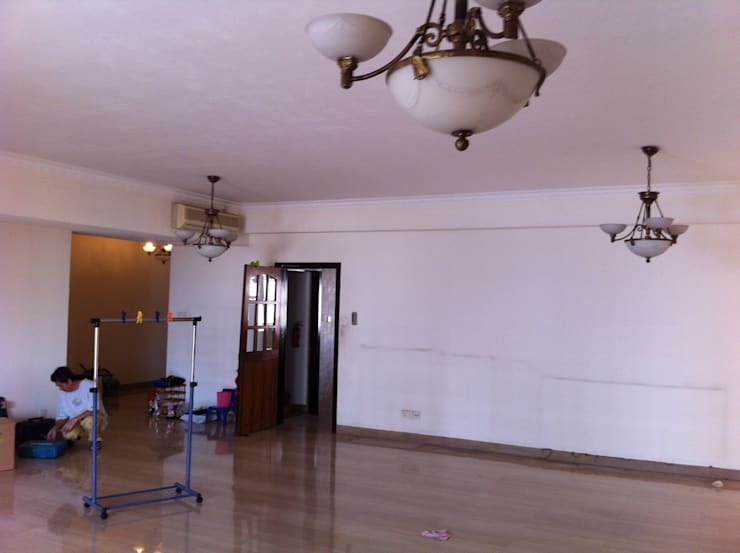 Here is another makeover story to inspire you further - An Old Home Turns Trendy.